On Sunday we had a clear run out of Darwin with one of the best and smoothest challenge departures yet. We even managed to strategically overtake the overall pole position holder and maintain first place for a good half hour. Since then, we have been overtaken by a number of strong international teams which have opted for an aggressive early strategy. Instead, we have decided to maintain our carefully planned and tested strategy which will hopefully give us a competitive advantage further down the track. We had Jason our newest driver in the car on the afternoon of the first day. He tackled his first road train with ease and is well on his way to being a seasoned veteran. By the end of the day, we finished in 8th place in our category and as the first Australian team in any of the classes. We are very happy with our progress, with the car handling better than 2013 and the team operating fantastically. Although we finished the first day in the same spot we stopped 2 years ago, we did so considerably earlier and in an overall better position. Our second day started earlier than expected after a preventative service of the car late on the first night led to a last minute rush in the early hours of the morning to solve a number of small potential problems with which could have severely impacted our racing outcome. This included designing and 3D printing a critical part from scratch around 1:30 am in the morning. Thanks to some fantastic teamwork the new part was mounted on the car and tested by just over 2 am. After a brief sleep for the Mechanical team, the car was charged and the fleet left at 8am on the dot. Thanks to the preventative work done by the Mechanical team, the car performed phenomenally well, even with high winds in several directions. Some members of the team say that the day was boring, but that’s exactly the way we want it. No panic, no drama… nice and smooth. We are currently predicting some worsening of the weather as we head down towards Alice Springs. In anticipation of this, our strategy team is working strongly to determine the best way for Arrow1-GT to continue her southward journey. We have currently setup camp just past the Barrow Creek control stop. 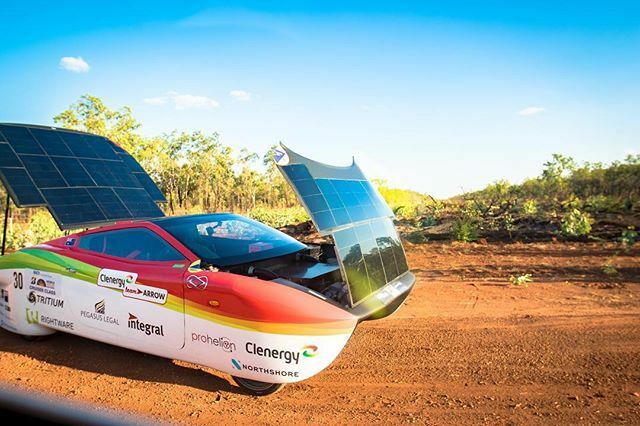 This is roughly 2 hours ahead of our last attempt at the World Solar Challenge. Our team has eaten and the tents are up. With a quick tyre change underway to ensure we are in peak condition, we are looking forward to passing the halfway point of Alice Springs tomorrow morning. A quick peak of this link tonight showed that we are only 2 hours behind the leaders, with two teams not that far in front, and two not far behind. We still believe we are in the mix despite the less than optimal conditions predicted over the next few days. 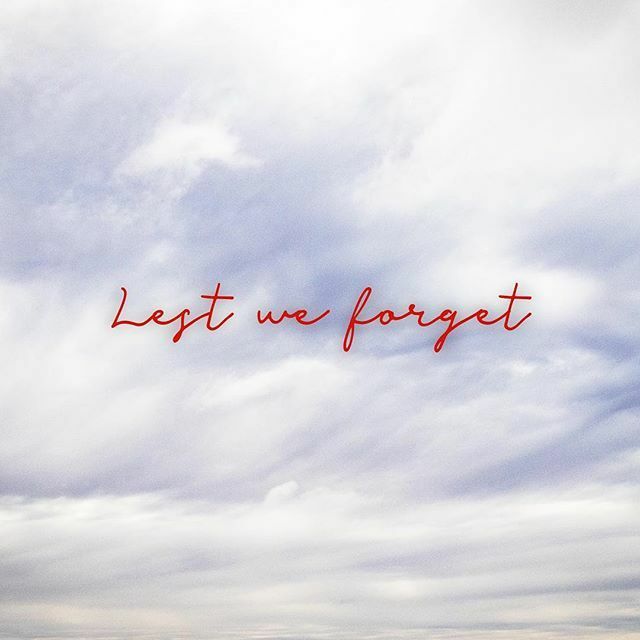 With work still to be done, it is best we get back to it. There’s still 1500 Kms to go! So we’re here. Finally setup in Darwin getting ready for the challenge. Most of the hardwork is done, with only a few little last minute things to finish off before we start the challenge on Sunday. 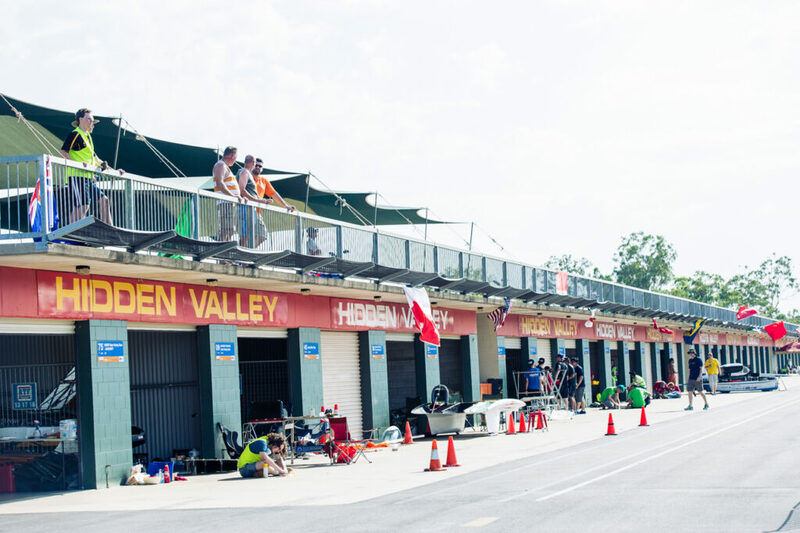 But, first things first – on Saturday we unpacked our trailer into our new pit bay at Hidden Valley race track. This is our home for the next week as we prepare for scrutineering and qualifications. Very quickly we marked our territory with Boxing Kangaroos and Aussie Flags. With our equipment from home all setup, we were able to work on the finishing touches for the car and setup our support vehicles. Some of the team members have also taken the opportunity to talk to the other teams – Australian and International alike. 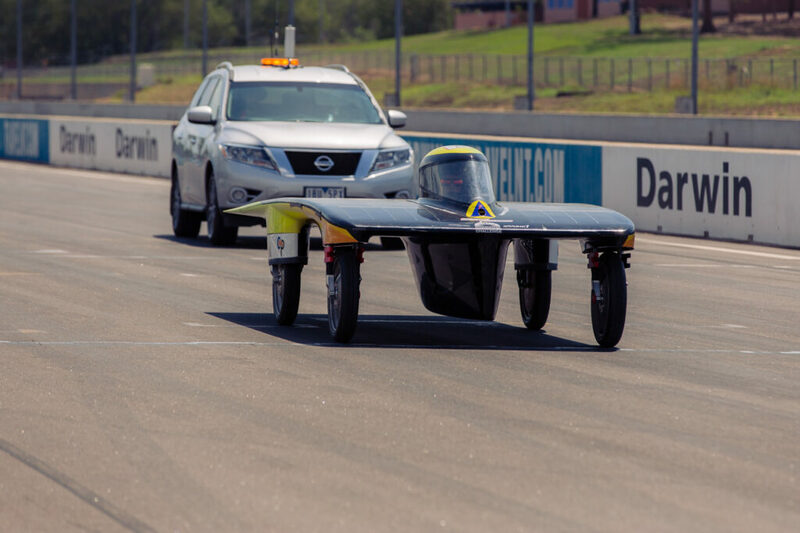 With three Aussie teams in a row at the pits, we’ve been able to make friends with the newest Australian Team – Adelaide University and catch up with our old friends Sunswift from UNSW. Across the paddock we have caught up with Western Sydney University and SA Tafe, the other Australian Competitors. Our race team this year has both experienced solar racers and those that are racing for the first team. The enthusiasm of the newer team members reminds those that have experienced this before what its all about. Tanya, our camp manager, has been out making friends with many other teams and can’t stop talking about the other cars and the ways other teams have tackled the same problems as us. Alex, from our mechanical team, has a plan to get a photo with every car whilst he’s here in Darwin. On Sunday we were out on the track ensuring all the systems of Arrow1-GT are operating well. Jason, our newest driver, enjoyed driving around the Hidden Valley track and looks forward to an opportunity to beat Chris’s track record. 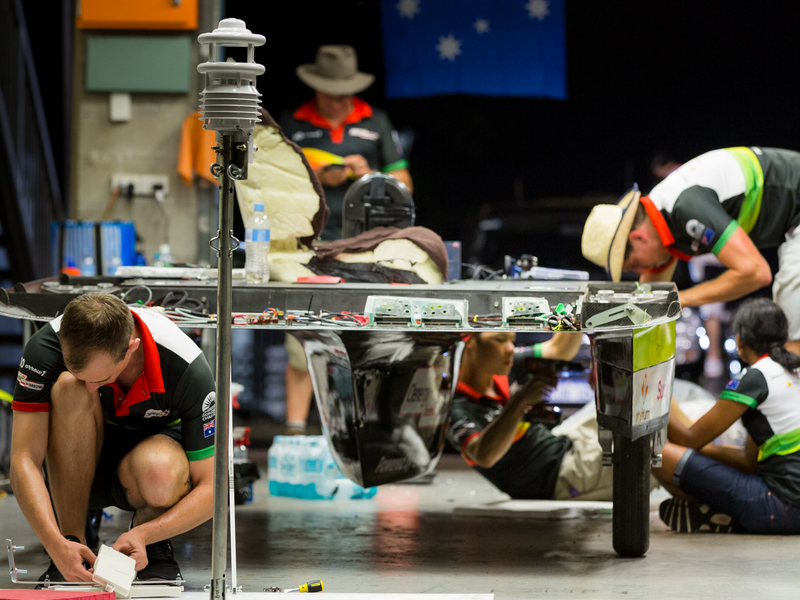 With scrutineering starting today many of the other teams are hard at work on last minute tasks. We too have a few small things to fix with our indicators flashing too quickly and our brake lights not working as they should. Over the next few days we will be testing on track, preparing our food supplies for the race and doing mock strategy drives out of Darwin. The first time racers in our team are looking forward to camping under the stars next week. Until then, we have scrutineering to pass, preparation for Saturday’s dynamic scruitineering, camping preparations to finish and finalisations for strategy. TeamArrow is putting all of its media content and latest information up on Facebook.